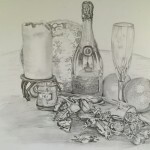 As part of my next assignment, I was tasked to create a still life and make a tonal drawing using pencil or charcoal with a theme of abundance. There were a lot of different textures to capture, the shiny paper on the chocolates were particularly difficult I found. Still I really enjoyed making the drawing and am pleased with the result. Next week, if the weather improves, I’m hoping to get out and do some drawing out of doors. Fingers crossed. This week, I’ve been getting back to grips with using an dip ink pen; one where you dip the nib into a bottle of ink to charge the pen. I’ve also been exploring the different textures and marks you can make with ink rather than the line drawing that I’ve been doing on the course so far. 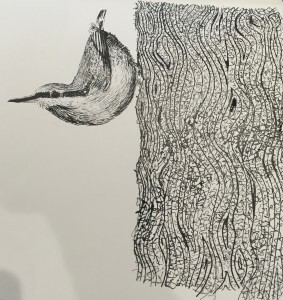 Here is one of the exercises I completed this week of a nuthatch clinging to a tree. I was quite pleased with it! This week I began to remind myself all about one, two and multiple point perspective through sketching some room interiors. It might be obvious to you but I had a light bulb moment in that if you’re looking at the corner of a room (your eye line and focal point) then you have to use two point perspective. 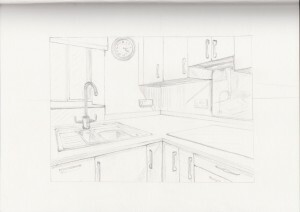 On my course, the notes said that typically when sketching an interior of a room, you would use one point perspective and by chance I’d begun to sketch the above picture of my kitchen but at an angle and of course, one point perspective wouldn’t work. I naturally used two point perspective and then was confused when I read the tutor notes. A quick “google” soon revealed that one point perspective would be right only if the back wall of the room opposite was on the same plane as you. 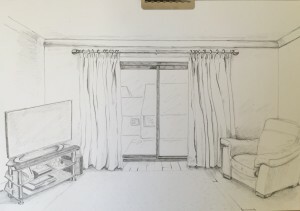 This is the case in the drawing of the living room below. So, I’ve got that now! I’ve also begun to prepare some drawings to send in to my tutor for comment at the end of units one and two. 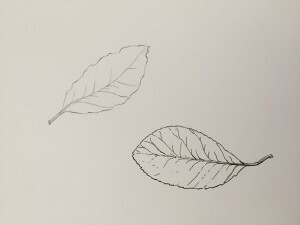 The line sketch of two leaves, one in pencil and one in ink is the first exercise I need to submit. The drawing of the room below, using one point perspective, is the second. I’m slowly beginning to feel more confident in my drawing again. I’ve got a couple more exercises to complete to submit and then I can get on with module 3 which is all about pen and ink. 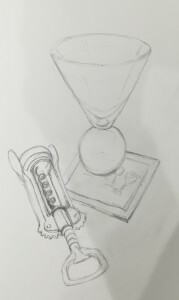 I’m looking forward to moving on from the basic drawing exercises of these first modules. 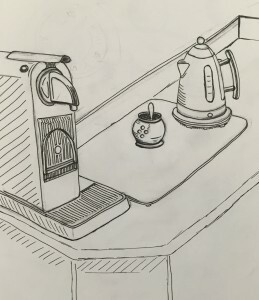 The course details arrived this week so I’ve been beginning to do some drawing again, starting with this quick line sketch of a still life. I’ve also been practising my “scales” with free hand straight lines of about 4 inches each, as well as curves and angles.